Woolwich Library has been re-located to the new Woolwich Centre, an integrated service centre for customers to access Council services. D-Tech has worked with Greenwich Libraries on a number of RFID installation projects including the heritage West Greenwich Library and Plumstead Library. The ECO self-service unit is proving to be a best seller for D-Tech with its strong, minimalist impression, environmental credentials and easy maintenance. 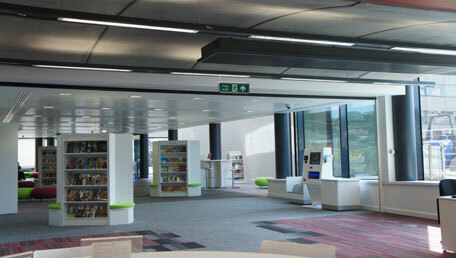 Moving away from stainless steel, ECO is available in a bespoke colour spectrum to suit any library interior. In this instance the white ECO has been chosen to compliment Woolwich Library’s new interior and to create an understated, up to the minute library space in the very modern, green and efficient Woolwich Centre. D-Tech also installed their stylish plexiglass, colour changing antennas and thermal imaging people counters at the library.